und dazu passend auch gleich eine kleine Börse. Hello there and welcome here in the QuiltBlog. Die Tammy ist sehr praktisch mit Innen- und Außentaschen. 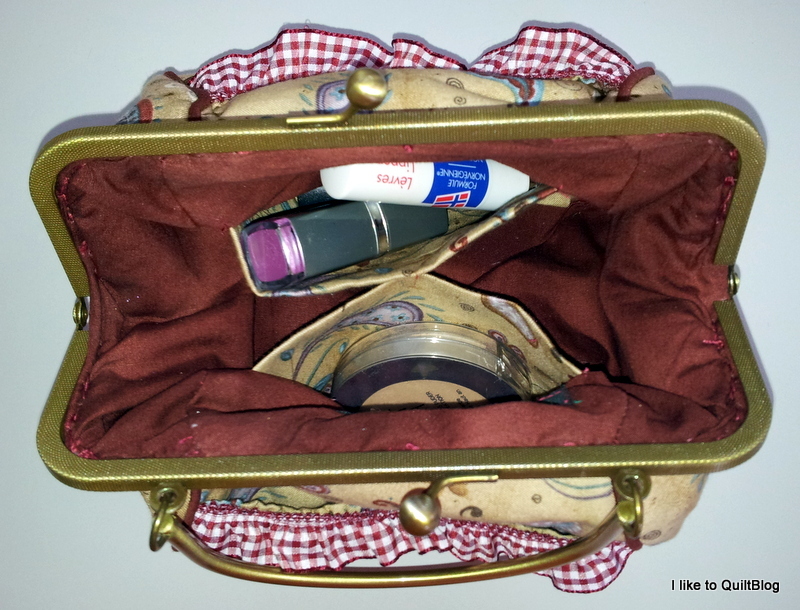 als Clutch, Kosmetik- oder als Nähzeugtasche z.B. and the extra pockets in- and outside are very functional. Geldbörse ist von Madm Samm. Die ausführlichen Anleitungen gibt es hier. the cute little UR-Priceless Coinpurse. You can purchase the great patterns here. Ich habe ein Bügelverschluss vom Prym modell "Elisabeth"
aber wie man sieht, hat er wunderbar gepasst. the pattern, but as you see it fit perfectly. hier ist es ganz okay. I love fabrics with paisleys and I enjoy adding pipings where ever it is possible. I must admit that I'm not excatly a ruffle type, but I think it looks okay here. es ist wie immer eine große Freude dabei zu sein. It is a big pleasure to be part of this wonderful international Quiltingbee. und vielleicht möchtest du sogar einen Kommentar hinterlassen. unter den abgegebenen Kommentare verlose. even want to leave me a comment. Am Ende des Bloghops wird ausgelost. and of cause I'll send world wide. da gibt es noch mehr Tammy-Bags zu sehen. hop to the following blogs to see more Tammy-Bags. Die Täschchen sind absolut hübsch. I love both the bags you made. I realy like the handle you put on the Tammy bag! sew very cute! So very lovely! I really like the purse with a handle. Where did you get it? I love the piping, it is a great addition! Your Tammy bag is lovely! Thank you for sharing and the great giveaway. Your bag turned out wonderfully! I love the way you used piping in the seam, it really makes it stand out! hej Bente, de er kanonflotte og måske er det lige det mønster der skal til for at kurere min sytørke. wonderful job on both bags. the piping and ruffle work well together. Nice Handle too. Boah, was für zwei tolle Taschen und wie wunderbar fotografiert. Super sind deine Taschen geworden. Mir gefällt der Henkel, cool dass der auch in der grösseren Grösse gepasst hat. Und die Paspeln sind schön. Natürlich lese ich deine Post bis zum Ende... Immer! Gerne nehme ich an der Verlosung mal Teil. Som altid får du tryllet en masse med stof og symaskine. To søde og feminine tasker/punge. Jeg får jo helt lyst til at prøve selv. Deine Tammy-Bags sind echt hübsch geworden und Du hast Recht, hier passen die Rüschen gut hin. An diese Bügelverschlüsse habe ich mich bisher nicht rangetraut, aber sie sehen wirklich gut aus! Oh Bente ! You're bags did turn out "sew" pretty ! I really like the bigger frame too. Deine Tammy und auch die kleine Börse sind super geworden. Die Große ist ja so geräumig, das hätt ich von einer Bügelverschluß Tasche gar nicht erwartet. Und wunderschöne Bilder hast Du gemacht! Deine Taschen sehen wirklich sehr schön aus, und sind dazu auch noch super praktisch ! Das Fotoshoting hast Du SUPER hingekriegt !!! Sehr stimmungsvoll! Süße Täschchen hast du genäht. Rüsche uns Paspel passen ganz toll und auch die Bügel sind klasse. Oh auf diesen Post freue ich mich schon die ganze Zeit, Bente! Deine Taschen gefallen mir super gut, die Stoffe sind toll - genau meine Wellenlänge - und für das Photoshooting hast Du den besten Platz ausgewählt. Soll ich Dir mal was sagen .... ich hab' noch nie einen Taschenbügel vernäht! Das sollte sich schleunigst ändern, das muß ich auch mal ausprobieren. deine Tammy Taschen sehen super aus. Meget smuk taske, det mønster må jeg bare eje og prøve. Stofferne vil jeg da også gerne eje. Your Tammy is gorgeous bente! Love that fabric! and the beach looks so inviting! I am headed to one on Sunday! Your pieces are wonderful. Love the hardwae and fabric choices. Good Luck! Thank You For Sharing. What a fabulous Tammy bag - I love the matching little purse too! Deine Taschen sehen klasse aus, die Stoffe sind einfach toll - wären genau auch meine Favoriten - und du hast sie klasse in Szene gesetzt! Wierdermal eine wunderschöne Tasche. Dein Taschenschrank muß ja aus allen Nähten platzen, und zur Belohnung noch so ein schönes Candy, super. und ich überlege , ob ich mir nicht doch das muster zulegen soll ?! Your bag is fabulous! I so love the colors.Thank you for participating in the hop. Bente I love the fabric you chose for your tammy bag. Wonderful job. Have a great day. Die Taschen machen sich sehr gut bei dem Fotoshooting am Strand! It's so true you can't make only one! Love your set, the piping is a nice finishing touch and the frames are very special. Just adorable Bente, love your fabric choices and the photos are wonderful!! Tasche und Börse sind beide super und gefallen mir gut. Du hast Recht, in diesem Falle passen sogar Rüschen. Und die Art der Präsentation gibt dem Ganzen noch einen Extra Kick. Toll. You have out done yourself. The bags are great and the photo is even better. I love your bag. You did a great job. Thanks for the chance to win. Love your fabric and the piping is especially nice!!! They are both lovely Bente. I love the fabric you have used. today is no exception...I adore your pics too ..
Lovely Tammy & U'R Priceless coinpurse! Thanks for sharing! What a gorgeous backdrop for your bags. Making both bags as a pair - great idea! Thanks for sharing. Your Tammy bag is really beautiful and the setting goes with it perfectly!!! Beautiful. Die Taschen sind ganz toll - ein wahrer Traum! Die Taschen sind super und toll in Szene gesetzt!!! Bente I love your twin bags! 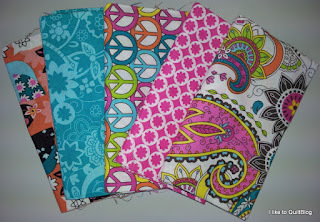 I love paisleys and the fabric is beautiful (and I really love that paisley fabric in the giveaway too) Your Tammy is so nice with the handle too. The ruffle is a nice accent. I love the ocean scene where you took the photos too. Very nicely done my blog friend! You saw my paisley wallet I made for my daughter, well I am working on another paisley project right now and you will see that in July. Both of those bags are so pretty. I love the little ruffle you added. I didn't think of them as beachy at first but then when you put them in the beach setting, they looked perfect. I really like your bags. I like the color of them. Well done. Love the piping! I haven't tried piping yet but it definitely set off your bag! Such a cute bag! And the ruffle looks good, too. Bente, I knew you would have a pretty bag and look what a gorgeous setting you are sharing it in. Daylight and dusk, both. You even made a Tammy Jr, LOL. Yes I know it is called something else. I think that was from a previous hop?? The fabrics are lovely and I like the addition of the handle on the clasp! You could definitely use it as a small purse if you wanted with that! THX for sharing this and the opportunity for your eye candy. Those are gorgeous and someone will be happy to have them added to their stash! Such a pretty bag, count me in. Hello, your bags are really cute, I love the fabric. Your Tammy bag is really nice, and since I have a UR Priceless coin purse, this bag would be a great addition! I love your bag. The piping is so cute.You did a wonderful job. Thank you for sharing. Cute, cute bags! I love the beautiful background in the pics! Love your bags! Enter me in the giveaway! It's GREAT! so cute, love your bags!!!! erst der Stoff von den Täschchen *schwärm*. An den Bügelverschlüssen habe ich mich noch nicht rangetraut. Lovely bags, all matching! Well done! Such a pretty bag! You did a great job! They are lovely. Great work. Beautiful! Nice colors and great sewing. I like your special touches. ich bin auch absolut nicht der Rüschentyp ... aber deine niedlichen Täschchen würden mir auch noch gefallen. Wirklich schön geworden und stimmungsvoll präsentiert! 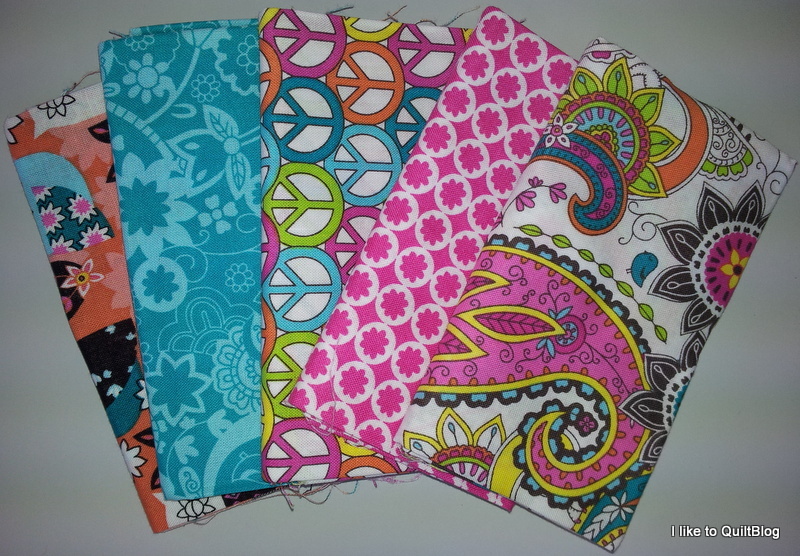 Love your bags and the paisley fabric.... also the peaceful water scenes! Thanks for sharing and thanks for the giveaway! Wunderschöne Taschen....Ich durfte sie schon in Natura sehen. Your bags are very pretty! The piping looks wonderful on both purses. Great job!! Your bags are sumply beautiful and love the set.Well done!! Your bags are so pretty. I also love the background of your pictures. Lovely bags!!! Beautiful scenery - wow!!! The bags are beautiful. Thanks for sharing. Your Tammie Bag is so pretty! What a lovely bag! You did such a great job, and I love the backdrop with the ocean? lake? I really love that bag, the largest one, and I love that you got up at sunrise to take the pictures. Way to go! Cute clutch and Tammy Bag! Nice day at the beach, too! How nice that beach looks and your bag is very pretty. I also like fabric with paisley in it. Thank you for sharing your bag with us today. Love your bags! Thanks for sharing with us! Thanks for the chance to win! Love these bags. I wish I would have tried them. Thanks for having a give away. Wunderschön Deine Täschchen, da stimmt alles Stoffauswahl und die Wahl der Aufnahmen einfach genial. Love the bags. Beautiful fabric. Thanks so much for sharing. Wow, die Tasche ist superschön geworden. Und gleich mit passender Geldbörse. Die Rüschen passen perfekt dazu. Wirst viel Freude dran haben. Beautiful bags! I also love where you photographed them! Just gorgeous! Love your paisley bag and the setting for your photos. The fat quarters are a lovely giveaway. Thanks for the chance! Very, very cute. I, too, love piping; it adds so much. Also, the ruffle is sweet; it's the perfect little accent. what a great bag design- yours turned out lovely.. Thanks for participating in the blog hop. Like everything you make...WONDERFUL !!! YOUR BAGS ARE LOVELY AND THE FABRIC VERY BEAUTIFUL. I ALSO LOVE THE BEAUTIFUL S CENERY WHERE YOU TOOK THE PICTURES. Woowww die Tasche und Börse sind mega schön geworden, grosses Kompliment. Vielen Dank für die super tolle Verlosung. Pretty! I love how you made them to match! I really like the look of piping. Another skill to add to my "want to try" list. Thanks for sharing! hat Dein Tag eigentlich mehr als 24 Stunden? Ich bewundere immer was Du so alles schaffst. Diese Täschchen sehen toll aus und nicht nach gerade wenig Arbeit. Your bags are beautiful!! Love that print you have used. A fun bloghop!! Sowas schönes würde ich mir nicht zutrauen, allein schon mit dem Verschluss oben. Lovely bag. Great fabric. I love paisley. This hop is awesome.